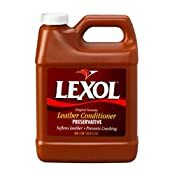 Lexol leather conditioner is a unique emulsion that feeds leather to keep it soft and supple while maintaining strength and durability. 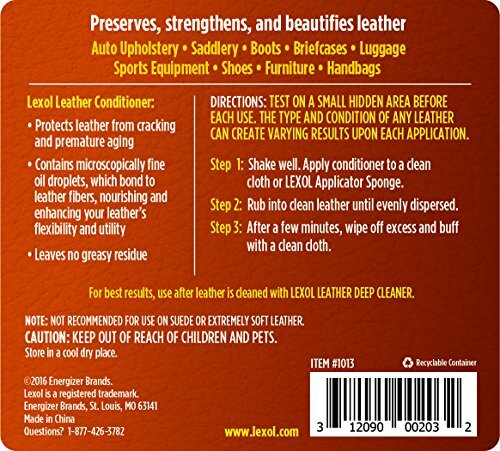 Regular use will maintain leather in top condition and not leave the surface slick or greasy. Just work it into the leather with a clean, soft, 100 percent cotton cloth or Lexol applicator sponge; allow the conditioner to be fully absorbed (15-20 minutes), and then buff off the excess with another soft, clean, 100 percent cotton cloth. Use it 4 or 5 times a year to keep your leather in top condition. You do not have to clean the leather every time you condition, but you must condition every time you clean it. This product is not for use on suede.